Our goal is to develop the most effective to do app on your wrist that is polished in every way, a delight to use and enriches people’s day. This is why we are really curious about your opinion. Apple has done great work with the Watch OS, however, our goal when creating Gneo was to raise the User Experience to a higher level. To achieve this goal we decided to start the process in an unusual way. Instead of studying and adopting Apple’s Human Interface Guidelines, we laid down the visual language of Gneo along with its feature list. The research of the SDK development-wise only started after we finished the prototype. Why did we do it this way? The answer is simple: Distinction. From what we have seen from competitors and other watch applications, they have stuck to the native look. This might be due to the fact that developers don’t have a physical Watch yet to wear everyday or it might be that it is safer to keep the risk of any failure low. Whatever the reason, the result is a dozen of uncharming applications that could easily result in users being disappointed about the Apple Watch experience. 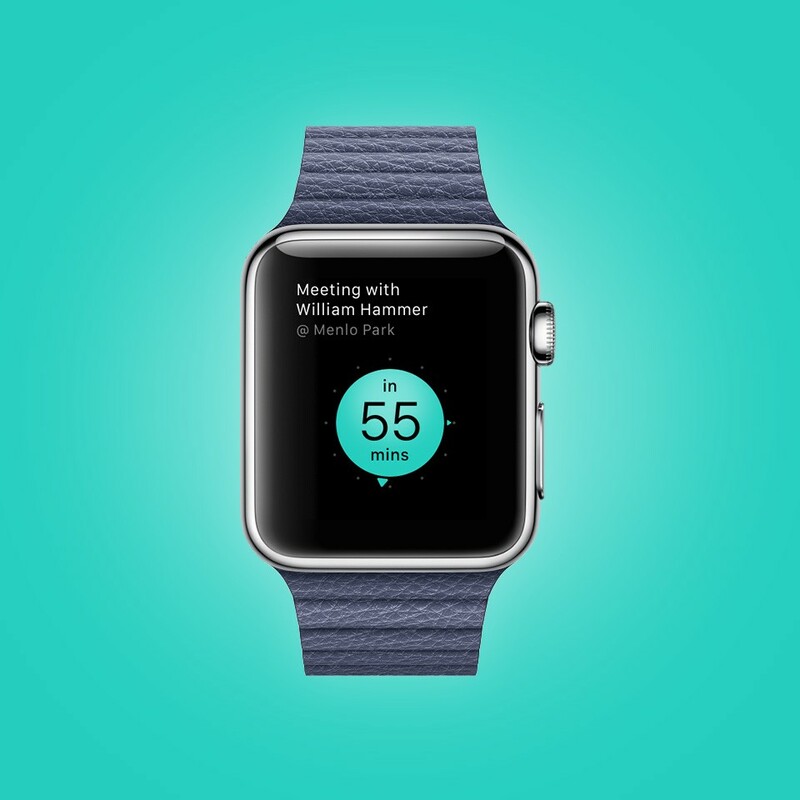 We feel encouraged enough to pioneer a new way of watch application design and UX. Time will tell whether our design philosophy is right. As we expected, this process rewarded us with extra difficulties SDK-wise. But where there are no boundaries there are no great ideas! In accordance with our approach the possibilities of the SDK were not limits, but rather they were inspiration for a more compact application which gives a more focused experience. We still have lots of our ideas left in our minds for future releases. Even though Apple’s website and videos showcasing the Apple Watch professes many features, a lot of these were not made available to developers. These include the Taptic engine and the accelerometer to mention just a few. Developers were also not able to customize the digital crown for scrolling between screens, nor create any dynamic UI animations. Another pain point is that we could not use custom fonts and actions in the status bar. As the Watch is so new ‘googling’ did not help with answering our technical questions and the SDK documentation was not clear enough to know if a limitation is a bug in the SDK or a feature. We think that we have maxed out the first version of the SDK and now we can introduce you to an application, that is much more than a single notification-porting of an iOS app. According to our thinking, Apple Watch will be used mostly on the go. What does that mean? Just imagine, you are walking along the street or traveling on the subway. You have to be aware of other people and your hands are permanently in motion. Meanwhile you are about to read this tiny screen and perhaps interact with it. Our aim is to help you to recognise the information as fast as possible, even help you to complete all your desired actions without any mistakes. Therefore we designed very clear and very focused screens with big buttons and texts. This is one example where we didn’t follow Apple’s guidelines and decided to show just one task at a time, not a list of tasks. To us, the Apple Watch is a ‘Glance machine’ and has to show people relevant and timely information in the few seconds it takes for someone to read the time on a standard watch today. Apple Watch has a very smooth design with softly beveled edges and corners. We decided to add the same aesthetic to Gneo. Therefore, we used circles or uncornered shapes. Even the soft custom typeface follows this approach. 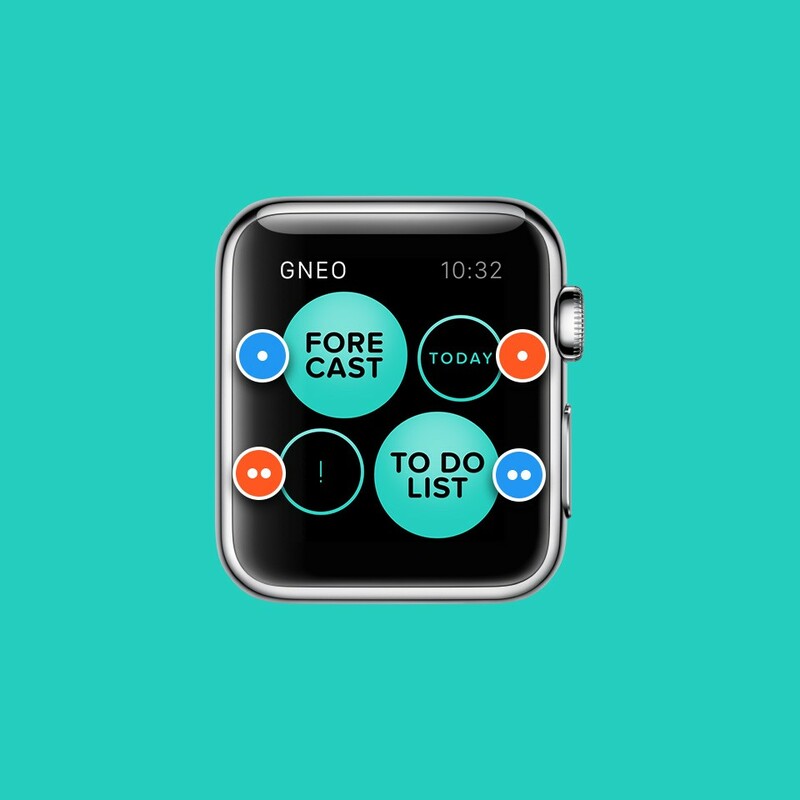 We believe that this makes Gneo a natural part of Apple Watch. Although Gneo for iOS has many features, we decided to only keep the functions that could work on-the-go as well. This premise formed the basis for our use-case matrix. We listed out all of the features in Gneo iOS against all of the situations where Apple Watch could be used, and if there was less than 60% relevancy, that feature did not make the cut to be included in the Apple Watch. 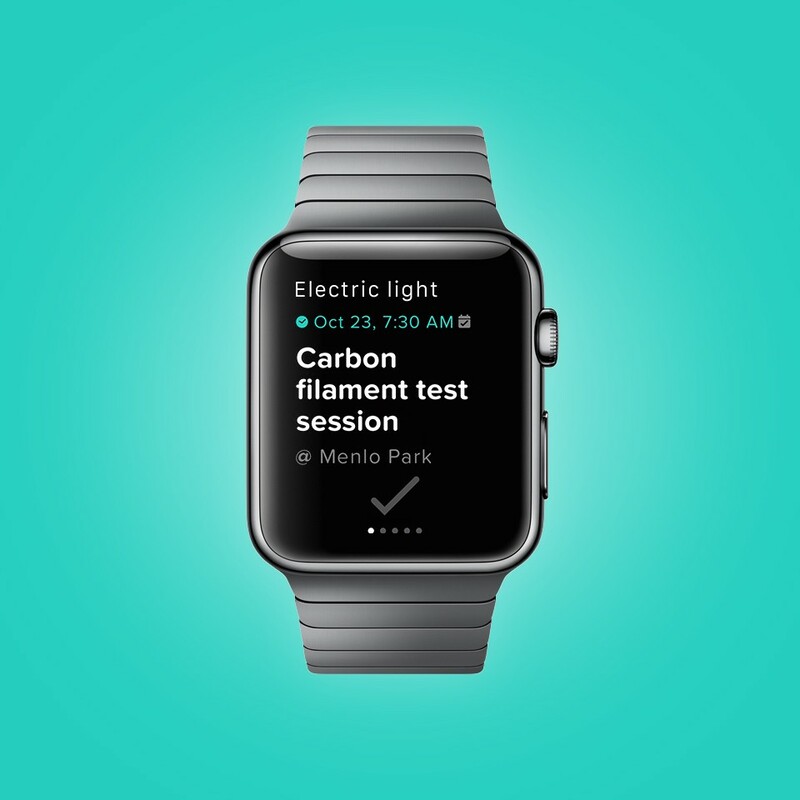 Gneo for Apple Watch focuses on the present and the close future. Forecast (close future): Your schedule for the week ahead. Today (present): Today’s schedule of events and tasks. Priority View (present): Your high priority tasks. To Do List (close future): Everything else on your to-do list. The Forecast shows tasks and calendar events for the week ahead. Similar to the week’s view on a weekly planner, which is full of notes and doodles, this screen gives a visual cue by showing how busy the next 7 days are using an arc. Quickly, at a glance, you already know how full your day is. Lots of notes — full day. Lots of whitespace — plenty of time. Gneo’s Glance screen also has same approach. When you have no more calendar events, but still have tasks to do, the visual aid is based on the classic post-it note usage. Many post-its, lot of tasks! 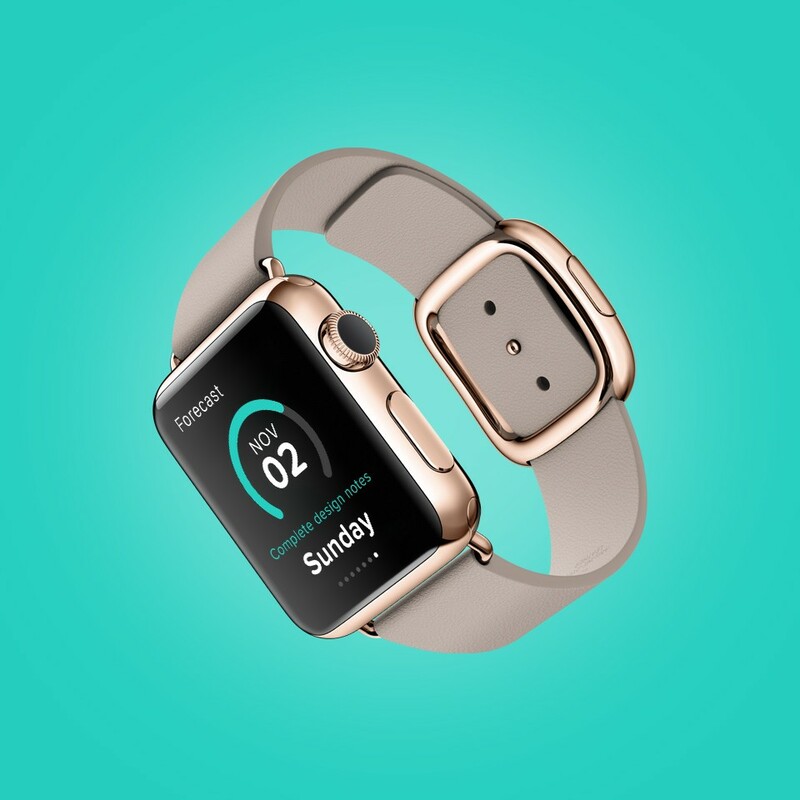 Glance is a very important feature of Gneo for Apple Watch. Apple describes the ‘Glance view’ as: “a browsable collection of timely and contextually relevant moments from the wearer’s favorite apps.”, i.e. : a bit like the ‘Today view’ in iOS. We hope that Gneo will replace Apple’s default Calendar Glance view, providing the user with useful and relevant information about upcoming events or tasks. Gneo’s Glance view provides visual aids beyond the title and location of the event. 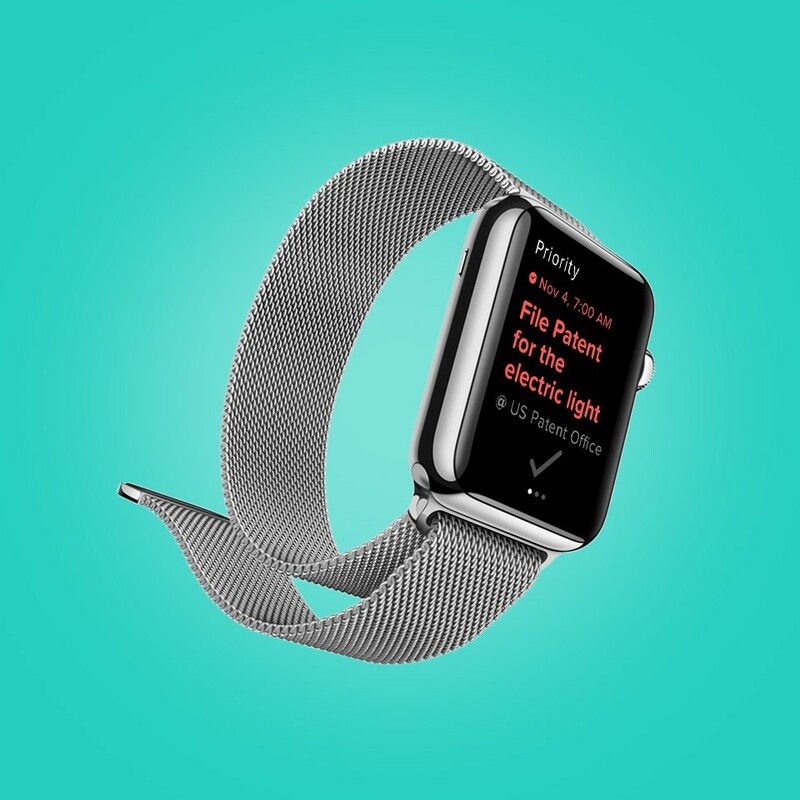 Since ‘Glance’ is an important part of Apple Watch we always provide information about upcoming events and tasks. We have created a unique contextual awareness algorithm to ensure Gneo’s Glance provides timely and relevant information. Firstly, Gneo displays calendar entries here, since this is the most relevant information on a watch. If there are no calendar events or scheduled tasks that day, then Gneo gives a summary of the highest priority tasks and provides quick access to this list. If there are no scheduled events or tasks and no priority tasks, Gneo will refer to all other uncompleted tasks. Every screen is designed to provide a clue to what there is left to do but still keep you motivated. We have also taken into consideration people who are color blind and offer them a color blind color scheme activated in Gneo iOS. This was inspired by the Founder, Anthony Keane, who is red/green color blind! Gneo for Apple Watch will support Japanese on launch. Gneo is a unique time management app used by high achieving professionals that helps users to prioritize their tasks, find gaps in their schedule to complete them and accomplish goals more effectively. 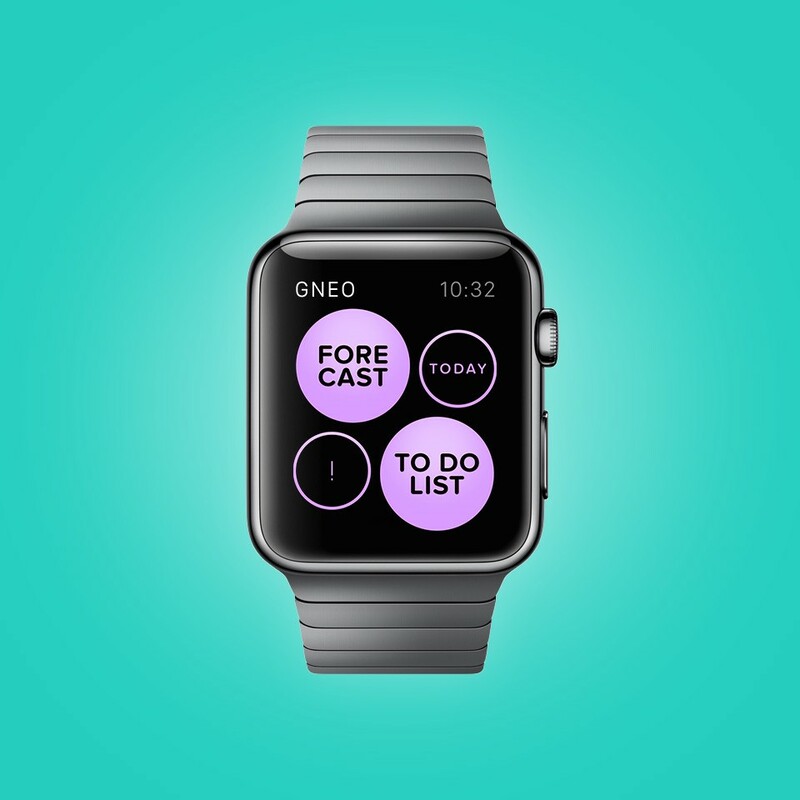 Gneo, which was selected as “Editors’ Choice” and “Best of 2013” by Apple, brings together proven time management principles with beautiful intuitive design, the first to-do app that helps people to achieve their greatest dreams. If Gneo was around in Edison’s time…. After 10 years of technical and project management experience at Deloitte Consulting and Accenture, the founders of Gneo, Anthony and Tatum, have put their enterprise knowledge and experience into Gneo, fueled by their desire to help people to achieve their greatest potential. Gneo for Apple Watch is designed in collaboration with smart watch designer, Gabor Balogh, who designed one of the original smartwatch concepts. Thank you for reading! We hope you enjoyed learning about our design process. Please, feel free to leave a comment here or drop me an email. Thinker, designer, honorer of traditions, seeker of inventions, lover of details.